Dounia joined MITC Capital in January 2011 as an Investment Manager. Previously, she joined CDG Capital Private Equity in 2002, where she was successively Investment Associate for 3 years and then Senior Investment Associate for 4 years as part of a development capital fund of nearly MAD 180 million. She also participated in the launch of another fund of nearly MAD 500 million. 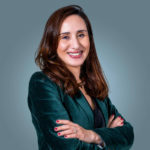 Dounia is a graduate of ISG Paris and is a laureate of the Executive Master “Project Management” of Ecole des Mines de Paris.